I have a problem with Motion axis move (MAM) command. There is an Allen bradley servo motor what is working well. But I need to add a new program section, wich is in a specified moment, the axis should move a certain distance. 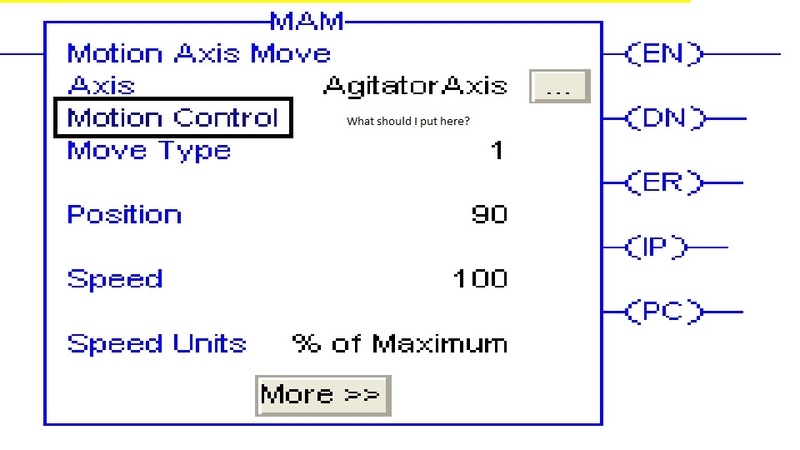 I think I need to use the mam command, just I dont know how can I configure the motion control part. I need to make a new tag ? or what ? I need to use a user define ? Every motion instruction requires a control tag. So yes, you need a new tag. Simple questions get simple answers. But I sense that you have more questions. Where many people stumble, including myself, the first time they get intimate with Logix motion instructions is with coding logic to insure the motion command blocks are in the proper state. If you instruct a servo axis to do a command that a previously executed command has control of, nothing will happen. Gerry you right, and forgive me because the wrong question. My really question is how can I create a motion control tag ? Can anybody give me a discription by step by step ? What should I do first ? What kind of variables need to declare ? I saw already before one motion control tag, there is some bit like somethnig.IP, something2.DN, something3.EN, something3.ER ... if I remember correctly. I havent problem with the motion instruction like maj, mas mam... just the motion control tag part. I searched some some photo from google, and I put a marker at issue place. How can I configure this part ? I hope du you understend of my really question already and sorry for the bad composition. In the space to the right of "Motion Control" type in the name of a tag, maybe "Fred". Then right click on it and select New "Fred" to create the new tag and all of it's components.